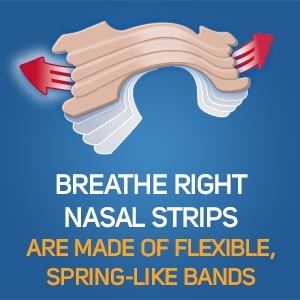 Within each Breathe Right nasal strip are flexible, "spring-like" bands. On the underside is a special adhesive that, when placed properly on the nose, gently sticks to the area right above the flare of each nostril. 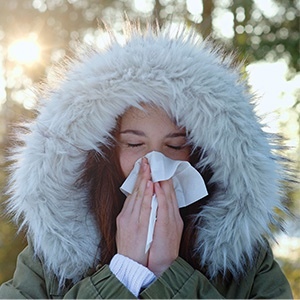 As the bands attempt to straighten back to their original shape, they gently lift the sides of the nose and open the nasal passages, providing immediate relief. Which helps you breathe better – with no medicine and no waiting. 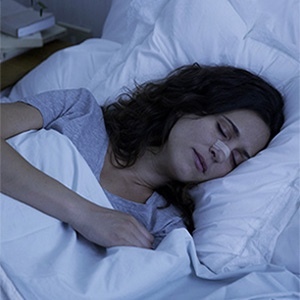 Once applied to the nose, Breathe Right Nasal Congestion Strips work by gently opening nasal passages allowing you to breathe through your nose instead of your mouth. Thereby relieving congestion, reducing snoring and helping you breathe more easily while you sleep. Base material - polyethylene on one side with hypersensitive pressure sensitive acrylate adhesive. Top material - the tape is supplied on a polyethylene coated bleached Kraft paper liner- silicone coated on one side. Spring (2 flexible bands) - matte finished polyester. 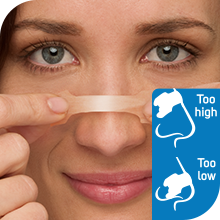 Breathe Right Clear Large Nasal Congestion Strips 30 is rated 4.5 out of 5 by 2. Rated 4 out of 5 by Husky390XP from I can breathe! My partner uses these to help with his breathing at night. Since using the Breathe Right's he is getting a better nights sleep. He does prefer the tan nasal strips, says they stick better to the skin.